Mark Schell, GEEP's General Manager in Alberta. 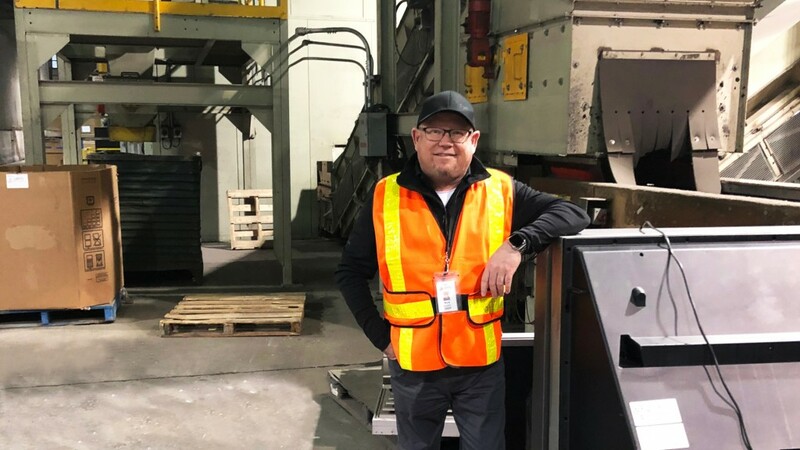 Mark Schell, GEEP's GM in Alberta, oversees operations at their e-waste processing plant in Edmonton and their Calgary facility. He says what they do in the electronics recycling industry is sometimes referred to as above-ground mining. "Effectively, we're trying to extract all precious metals and resources from any used electronics that we process, and we have end markets in different parts of the world," says Schell. The plant in Edmonton, a dedicated end-of-life e-waste recycling facility, processes millions of pounds of electronics waste per year. "Everything gets destroyed in Edmonton," he explains. "Our environmentally responsible de-manufacturing processes break down e-waste through a series of shredding, granulating and separation technologies." GEEP (the ‘G' pronounced as in ‘good') also manages a lot of steel. "Through our relationship with the City of Edmonton, all of the white goods that come through City eco-stations, such as fridges and stoves, come to us," Schell says. "The City removes the freon from any of the refrigerators or freezers, and those materials come to us. We bale it and send it off to our steel downstream, which is in most cases Triple M Metals. Schell describes GEEP's Calgary facility as basically a cross-dock for e-waste that is sent to the main facility in Edmonton. The Calgary facility's primary purpose is its ITAD (IT Asset Disposition) services. These services are able to extend the useful life of electronic devices by wiping them clean of any data to allow for secure repurposing and eventual resale. "We offer different solutions to different types of customers, anything from banking institutions to the military, to large corporations including oil companies," he says. "Once their IT equipment comes off-lease, or when they're ready to exchange it for new equipment, we are their asset management partner." He says the majority of the used electronics equipment they get in Calgary will be no more than two or three years old. "It arrives at our facility, becomes serialized, and then data-bearing assets are wiped to an unrecoverable state in order to be refurbished and repurposed without any confidentiality risk." GEEP follows the NIST 800-88 standard, which is the current benchmark for media sanitization, utilizing advanced data erasure software. ITAD (IT Asset Disposition) is a very important component of GEEP’s operations. Schell explains that they have the ability to sanitize any type of media, from traditional hardware to new SSD drives. "For certain contracts, we have to destroy the hard drives, but in most cases we can remarket the computer or the printer or other equipment, and we share the revenue with the company that provides us the equipment." He adds that some of their clients want to have assets wiped and then shredded, but in most cases, it's one or the other. "Either way, we take in data-bearing equipment from our customers and we manage that asset for them." GEEP clients receive official certification that states their data contained in old electronics has been wiped, and/or the equipment has been destroyed. "Data security is the most important part of our business," continues Schell. "We hear it every day in the news - somebody's information has been hacked or someone out there has found some unique way to gather information and to steal identities or credit card numbers. "GEEP takes data security very seriously. Our sites are physically secure with 24/7 monitoring, and we have designated areas within each building that only certain employees have access to. All employees are required to have annual background checks." In addition he says, staff go through security checks to ensure that no data-bearing equipment leaves their facility. Schell adds that in the five years that he's been at GEEP, he's noticed a lot more attention paid to ITAD by the companies they serve. "Everybody is more concerned about it," he says. "I think there's a lot more knowledge about it and our clients want to make sure they're showing their clients that they're doing things in an environmentally responsible way. "We're an important cog in that wheel. It's why we've been audited as often as we have in Calgary for safety and security." End-of-life electronics are sorted by type and vetted for any non-recyclable or hazardous components. When a load of material arrives at either of GEEP's Alberta locations, often it's mixed and may include cell phones, computers printers, coffee machines and microwaves. In Alberta, Schell says this is more of a challenge than in other provinces because of the provincial government's regulatory limitations on what can be processed as e-waste, and what is not part of the program. "If we're handling Alberta materials, there's only a handful of items that are part of the Alberta Recycling e-waste program," he explains. "That includes visual display devices, computers and peripherals and printers. Anything else, if it's a microwave or a coffee machine, or even cellphones, those are not part of the provincial program here in Alberta. Therefore, there's no fee paid to us by Alberta Recycling for processing those items." But they still have to separate everything. Sometimes, material is separated for program-related reasons, and sometimes it is separated for value-related reasons. "Sometimes we separate items just because there's a safety risk," he explains. "For instance, anything with a lithium battery in it, we cannot run that through the shredder. When a battery gets pierced, it explodes immediately." He says once they separate everything into its proper categories, depending upon what it is, some of it gets de-manufactured by hand. The majority of their materials in Edmonton go through a chain shredder. "It's a fairly large piece of equipment that has two giant chain link chains in it that spin at about 800 RPMs," explains Schell. "It basically smashes everything into small pieces and we can adjust the size of the particulate." After that, material goes through a magnet where steel is extracted and then onto a long belt where materials are manually picked out. "There is a fairly sizable manual component to the chain shredding process," he explains. "Depending upon what we're running, sometimes we pick the value and sometimes we pick the ‘refuse.'" With regard to circuit boards, GEEP uses what Schell calls a knife shredder. "Some call it a ring shredder," he explains. "It's a smaller unit with blades that cut the circuit boards into small particles, about the size of a toonie. Once we've done that, it goes into a bulk bag and then that material gets sorted and sold to refineries in various locations throughout the world." He says circuit boards probably have the largest component of precious metals. "If you go back to an old computer, from the 1980s and 1990s, those had a lot of gold in them," he explains. "As manufacturing has evolved, in order to reduce costs, the use of gold has actually been reduced. But there still is a fair amount of gold in a circuit and IC chip. If you see a circuit board with a lot of IC chips on it, normally, that board has a fair bit of gold content." He adds that RAM chips contained in a motherboard also have a substantial amount of a gold in them. Still, the single highest volume of precious metal that they process is copper. "Copper comes out of the circuit boards and other materials that we send to refinery," he says. "There is also a fair amount of copper that comes out of old CRT televisions. "We manually disassemble upwards of a thousand of those every single day in Edmonton, believe it or not," he continues. "Inside is a component called a copper yoke located near the back end of the tube, with substantial pure copper windings on it. These yokes result in a fair bit of copper that comes out of that process." He notes that batteries are a particularly challenging aspect of handling mixed waste materials. "There are so many different types of formulations," says Schell. "You'd think maybe there's only half a dozen different types of batteries, but there's probably 100 different types. The different formulations require different recycling. Some of it, you can actually recycle and reuse and capture, like with lithium batteries. They actually pull the Lithium out, and can reuse it. Alkaline batteries have to go to a hazardous waste facility." He says they also get a lot of lead-acid batteries through their facility, which are sent off to a recycler - but it's still a challenge. "It's becoming more difficult because of rules on transportation and rules on how much you can actually store at any given time. "Lithiums though are the worst type of battery for us. They can start a fire and can be difficult to handle." Chinese import restrictions that have been put in place over the last few years have definitely affected the e-waste recovery business. "It was the primary downstream for many in our industry," Schell says, adding "When I run e-waste through my shredder, I end up with a lot of small-fraction plastic." One particular challenge with plastics he explains, like with batteries, is that there's so many different types of formulations. "It's not like you can just take up a big bale of plastic from printers and CRTs and flat-screen TVs and wherever else and just melt it down and then extrude it into a pellet. It just won't work. Whoever buys it is going to get inconsistent materials when they use it for their products. "We've found alternative markets that are environmentally conscious," he says. "It's taken some of value out of the plastic but there are still places where we can send it." When it comes to the global issue surrounding the use of illegal foreign end markets for dumping e-waste materials, Schell says that they do not send anything to places that haven't been fully vetted and approved by either the R2 program or by the Alberta Recycling program. "Both of those programs require that e-waste materials not go to third world countries, for example," he says, adding that overall, he feels the global issue of illegal dumping of e-waste is improving somewhat. Besides better regulations and understanding about the issue, along with the industry's increased adoption of regulations and standards such as R2 and e-Stewards, which make it harder for those trying to ship e-waste overseas, Schell says part of the reason for this improving global situation lies with changes in manufacturing practices. "Manufacturers, for the most part, are making things better now," says Schell. "Many are making items so that they're more easily recyclable." As an example, he points to the fact that they do not run into leaded glass as much anymore because lead-based CRTs are no longer being manufactured. "We're still going through the backlog of those that have been around for decades though," he adds. "Now, we have flat-screen TVs, almost everything is an LED now, and there's nothing really dangerous about handling those." Another problematic material they don't see as much anymore is Mercury. "Old LCDs with tubes that had Mercury in them aren't being made anymore," he says. "There are better manufacturing methods that are being used now, without the use of Mercury." "Not many people know this, but the very first electronics recycling program in North America started in Alberta in 2004," Schell says. The program is currently managed by Alberta Recycling Management Authority, the same organization that oversees other provincial stewardship programs, including tire, paint and oil recycling. This is unlike other provinces in Canada, where the EPRA (Electronic Products Recycling Association) oversees government mandated e-waste collection, reuse and recycling. While the government of Alberta designates which electronics are included in the provincial program, Alberta Recycling manages the program, and compensates e-waste recyclers for recycling items that are permitted, but does not compensate for those items not included. Schell feels strongly that their provincial government needs to include more electronic items for recycling. "In other provinces the government has added items such as microwave ovens and coffee machines," he says. "Basically anything that has a cord or a battery in it is part of these programs. That's not driven by EPRA, that's driven by the government. Here, the Alberta government has only included limited items and that's been in place since 2004." He adds that the government in Alberta has been talking about the benefit of adding additional products, and that Alberta Recycling is ready to proceed the moment the government gives them the green light. "But they've not given them the green light yet," he continues. "So basically, in effect, many of the items that aren't part of the Alberta e-waste program could still possibly be finding their way into landfills. "It all comes down to the policies and regulations that are put forth by the government - the environment department," Schell says. "What we've done to counteract that at GEEP is that we don't permit any of the non-eligible materials in Alberta that come through Edmonton to go to the landfill. This article was originally published in the March 2019 edition of Recycling Product News, Volume 27, Number 2.